Your time will not be wasted here, as we aim to provide as much information as possible about the best chameleon cages for sale without taking up much of your precious time. Based on value for the money and quality, Dr. Fox believes the Exo Terra Allglass PT2600A1 makes a good choice. This is due to the remarkable patented front window ventilation system that keeps your reptile or amphibian pet cool and comfortable inside. The component allows the animal to breathe optimally without being overexposed to the elements. The waterproof bottom keeps the unit resilient against moisture while the raised bottom frame accommodates a substrate heater that ensures your pet makes it through the chilly seasons. Should the Exo Terra Allglass PT2600A1 be unavailable, you can confidently pick the Zoo Med Reptibreeze, a good second best option. The dual doors in the front allow the pet owner easy access for cleaning, dusting and other maintenance operations. The frame is raised at the bottom, allowing you to install a heating system so you can keep your pet warm during cold months. The top ventilation system allows air and beneficial UVs to reach inside the cage, and your pet can grow strong and healthy. The outside edges leave some space that can be transited by small insects, therefore making the cage more difficult to clean. An excellent option for your reptilian friend, featuring an optimal design. Comfortable to use. This cage is easy to assemble, as instructions are provided, and you only need a screwdriver to fit all the panels together with screws. The open-air design is preferred by many reptiles because they will not feel suffocated in their cage. Cleaning the cage is easy since the bottom can be removed for regular maintenance. The anodized aluminum used is lightweight. You will have to pay close attention to the assembly stage, as the screws need to be very tight to avoid any mishaps. 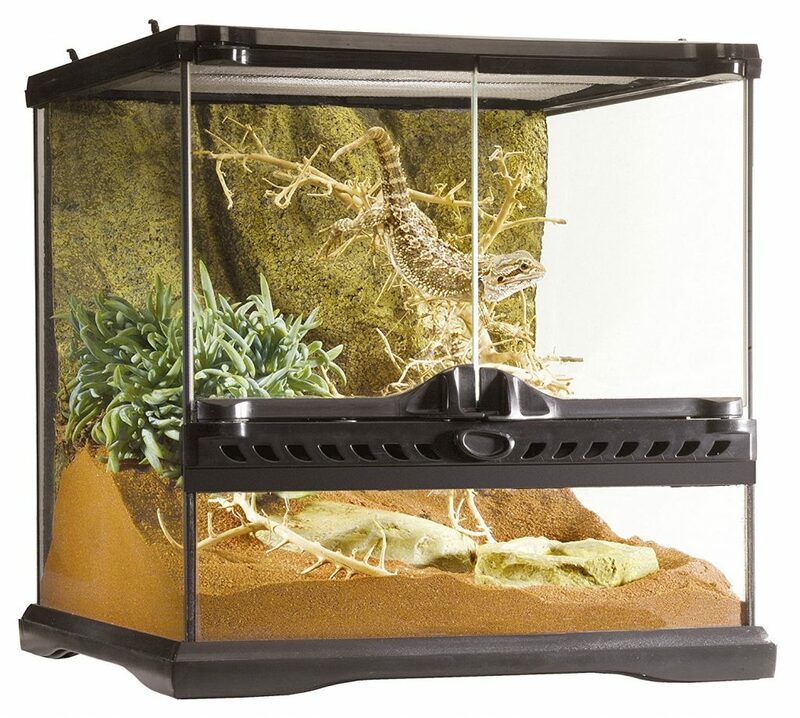 A cage for lizards and chameleons that is easy to assemble and has a convenient design. This type of cage offers as much of a realistic environment as such a product can. 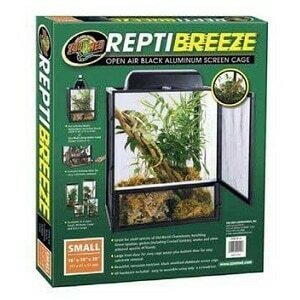 The open-air design will allow your little gecko or chameleon to breathe freely. The aluminum construction is lightweight, yet durable. You will have access to the interior of the cage via the large door installed conveniently on the front. A bottom door helps with easy cleaning, as well. For a stable configuration, make sure that all the screws are squeezed as much as possible. A good alternative for arboreal lizards, with an easy to clean and maintain design. It is not difficult to see why the following models are consumer favorites. They provide a safe habitat, ensure comfort, and make pet handling easy. Here’s why. 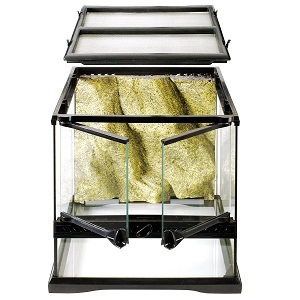 A nicely designed terrarium for amphibians and reptiles, the Exo Terra Allglass PT2600A1 features a proprietary front window ventilation as well as dual front opening doors that enable easy access when feeding or misting the pet. It also enables more hassle-free maintenance while ensuring your pet enjoys optimal ventilation without having an easy means of escape. During maintenance, you can keep one door shut all the time while still keeping the humidity and heat at good levels inside. With the pivoting doors, you won’t need to worry that sand and other debris can get jammed into the hinges. The raised bottom frame accommodates a substrate heater so the creature can feel comfortable when the weather is cold. Providing a good environment for your pet to live in, this terrarium also has a uniquely designed lock so that the doors can be opened separately. While infrared and UVB penetration is enabled by the full-screen top ventilation, the component is completely removable for effortless cleaning and decorating. 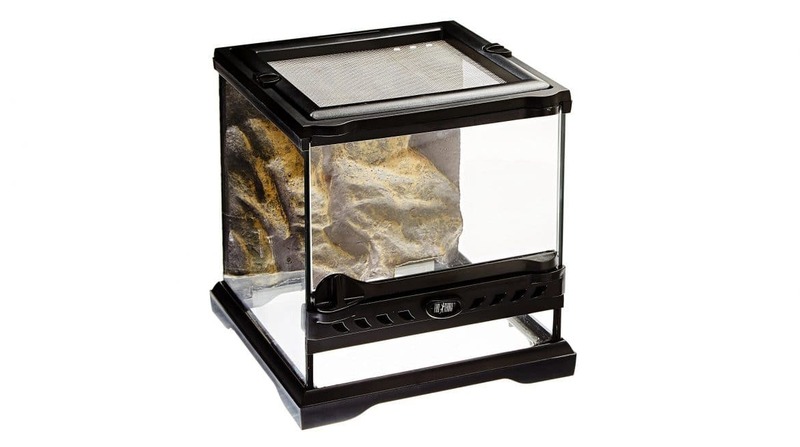 A good glass terrarium for amphibians and reptiles, this unit allows easy access to the inner section for misting, maintenance, and feeding due to the dual front opening doors. Thanks to the specially designed lock, your pet cannot escape easily through the doors, which can be opened separately. Compared to sliding doors, the pivoting doors on this model do not get filled with sand and other debris that prevents efficient closing and opening. With the raised bottom frame, you can install a substrate heater to keep the terrarium comfortable for your pet during chilly seasons. The full-screen top ventilation allows infrared and UVB penetration to help keep your pet strong. It is completely removable so that cleaning and decorating can be done easily. The gaps on the outside edges of the terrarium doors may enable small insects under observation to fly through, so some modifications may have to be made. Geared for small species of Juvenile Green Iguanas, Old World Chameleons, and other arboreal species of lizards, this open-air aluminum screen cage provides easy access and maintenance. You will love the black anodized aluminum build that is easy to assemble and setup so your pet can have a safe and solid habitat while enabling effortless observation. The large front door provides a problem-free cage access so you can change the layout, clean the cage, or feed your pet, as needed. The bottom door facilitates the easy removal of the substrate for replacement. The screen cage is made from corrosion-resistant material for durability. The hardware needed for setup and construction is included, along with a few extras to enable you to put everything together easily with just one screwdriver. Thanks to the open-air design, cleaning the cage is easy as well. You wouldn’t have to exert too much effort to clean off the gunk from the wire mesh cage. With all the panels coming together smoothly and attached to one another through the supplied screws, this open-air aluminum screen cage only needs a simple screwdriver to assemble. This is a good cage of choice for arboreal lizards such as anoles, geckos, and others, as well as small species of Juvenile Green Iguanas and Old World Chameleons. Reaching inside the cage is effortless via the innovative large front door, while the bottom door enables quick and easy removal and replacement of the substrate for a clean habitat. Thanks to the anodized aluminum material, this cage provides a nice-looking habitat for your pet that is also resilient against corrosion and is lightweight. You won’t need special skills to put the parts together because all the needed hardware is provided and the panels come with intuitive assembly. Be careful to screw the panels together tightly so as to ensure a stable and non-wobbly structure after full assembly. 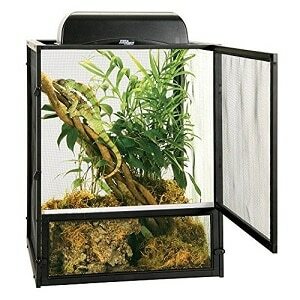 This open-air black, aluminum screen cage offers a good option for pet owners of small species of hatchling Green Iguanas, geckos including Crested ones, anoles and other arboreal lizard species, and Old World Chameleons. You can watch your pet and observe it to ensure it thrives in a realistic environment. The large front door provides an effortless access to the inside so you can clean, maintain, or feed your pet without a hassle. You can also easily remove and replace the substrate when needed thanks to the bottom door. With all the necessary hardware shipped in the package, along with some extra screws, all you need is a handy screwdriver to construct a good habitat for your pet. Due to the open-air design, your pet receives proper ventilation. The black, anodized cage is made to be corrosion-resistant for dependably lasting use. Shipped with the necessary hardware as well as some extra ones, this aluminum screen cage is ready for assembly using just a screwdriver. You can use this for small species of hatchling Green Iguanas, Old world Chameleons, Geckos, including Crested species, anoles, and other arboreal lizards. To facilitate easy cage access, this model features a large front door that allows you to reach inside and do cleaning, feeding, and other pet care tasks. Because it is designed to be resistant to corrosion, this cage can be used for a long time and provide safe housing for your crawling pets. The bottom door provides an easy removal of the substrate inside for problem-free replacement and maintenance. Make sure to assemble and screw all the panels tightly together so as to get a stable configuration that stays in one piece and does not wobble in case some pressure is applied to the corners or edges or from the inside by your pet. Chameleons, arboreal lizards, iguanas, geckos, and anoles, among others, are easy to take care of if you get a suitable cage to house them. Both reptiles and amphibians do not require constant feeding and the amount of cleaning is minimal at most. Just what do good cages for reptiles such as chameleons come with? The size of the animal, as well as its environmental needs, dictate the kind of enclosure or cage you should get. A variety of terrariums are available for smaller species of animals. Make sure the shape also suits the needs of the animal. If the cage is narrow, a chameleon will surely enjoy having a climbing branch. Low and wide cages are more suitable for ground-dwelling species such as tortoises. You can find glass terrariums. You might also go for an aquarium with a screen cover. Bear in mind to house your pet according to their species and size. 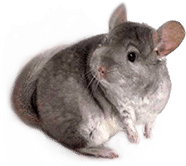 Mixing pets in one enclosure should only be done if they are compatible. Get the largest cage size possible since your pet needs to move about as freely as possible. A thermal gradient may be needed in the cage, with one side providing a basking spot and the other serving as a cooling area. Mesh cages are great for their optimal ventilation. A moisture-resistant bottom frame protects the animal from dampness from the base of the enclosure and also ensures that the pee or any form of wetness does not ruin the base section. The unit should be draft-proof so that your pet isn’t bothered by strong gusts of wind. A well-lit enclosure allows you to maintain and handle your pet easily. A vented wire screen top provides good ventilation along with the side panels. Some glass units have a vented front-door ventilation system to accomplish that. Some popular models feature panels that can be screwed together easily so the enclosure is up and ready for use in just a small amount of time. You should be able to install a water area with a filter, a heater, and some gravel easily. The land section should be easy to fill with substrates including potting soil, small gravel, cypress bark, sphagnum moss, or loam. It should also be easy to empty of the dirty substrate when it needs to be replaced. Since chameleons and other arboreal lizard species need something to climb onto, you should be able to decorate the cage with plants, driftwood, rocks, and moss. Moderate-size lizards can have plenty of uses for prayer plants. The plants should be low maintenance as well. Dual opening doors facilitate problem-free maintenance and pet care. Mesh enclosures make cleaning easy. You can take the cage apart one panel at a time and give the sections a thorough cleaning as needed. The dishes, cage decor, and wall coverings can be washed and disinfected easily. Most importantly, the cage should be escape-proof.